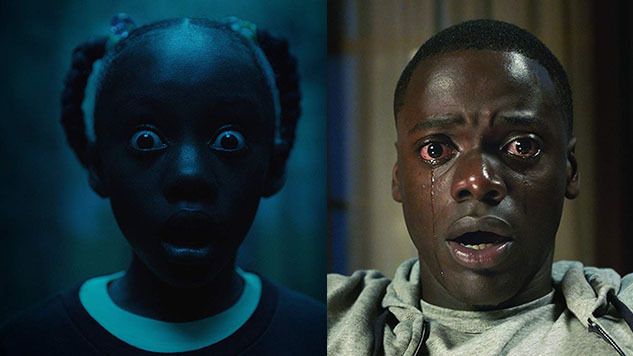 Jordan Peele "elevates” horror by descending into the underworld. Be sure to check out Paste’s review of Us by Dom Sinacola. The following contains major spoilers. The people at the door never say anything, but the child, who has not always lived in the room, and can remember sunlight and its mother’s voice, sometimes speaks. It’s a joy unparalleled to watch a new artist’s distinctive style as it’s emerging. With Us, comedy-sketch-writer-turned-horror-director Jordan Peele manages to create another deeply disturbing thriller with the same perfectly timed gallows humor, eye for unforgettable imagery and skillful mythmaking as his (also extremely good) Get Out (2017), while somehow looking nothing at all like it. I complain time and again about Hollywood’s reluctance to give us a diversity of experience, as legions online scream about any inclusion of female leads or people of color at the center of a story being pandering or box-checking, so it is gratifying that Us manages to both prove my point about the value of storytelling from a new perspective and debut as the number one movie in America. The online discourse surrounding Us is in the midst of a backlash against characterizing the movie as “elevated horror,” justly reminding horror fans that an important and diverse genre is typically viewed with disdain even when there are just as many eyerollingly terrible dramas in theaters. In Peele’s case, “elevated” is a particularly puzzling designation when his movies are based so firmly in the idea of a sinister underworld, out of sight and mind but always a danger. Get Out gave viewers “the Sunken Place,” a dark void of a prison in which the prisoner is powerless in their own hijacked body. Chris (Daniel Kaluuya) is hurled into that underworld after a slow build up that explicitly paints him and earlier cold-open victim Andre (LaKeith Stanfield) as prey using the same cinematic grammar as decades of slasher films. The awkwardness, the feeling of not belonging in the Armitage household even as he keenly senses the malevolence behind their smiles, is as much a weapon of Chris’s captors as the drugs and hypnosis. That theme of being cast into darkness—of being shoved under into a place of powerlessness and despair, forgotten—reaches its zenith (or perhaps its nadir) in Us, Peele’s statement on not just race but on particularly American ideas of disenfranchisement and othering. It is not merely for simple exposition that the film begins with text explaining that thousands of miles of tunnels run beneath the United States, abandoned and bereft of purpose. Us gives audiences a new twisted mythological construct, the Tethered, a vast subset of humanity created to be perfect doppelgängers of people above. Separate bodies, but with one shared soul, we are told. It is these shadowy mirror images of Adelaide (Lupita Nyong’o) and her perfect nuclear family that emerge from the night to invade their vacation home and usher in a violent reckoning. Red, Adelaide’s Tethered (also Nyong’o), is the embodiment of the denied humanity that lies out of sight, out of mind, as Adelaide lives a life of comfort. Gripes about the plausibility of this dark mirror-society, which somehow produced what was probably generations of pristine simulacra even though we’re assured that the masterminds behind the insidious cloning project simply abandoned it, don’t matter all that much if you accept that the Tethered are capable of independent agency but constricted and guided by the powerful compulsion to mimic their “originals.” Red’s particular talents could facilitate the diabolical scheme that reveals itself as the story unfolds. One could also argue you’re being told a fairy tale rather than speculative fiction. Lay that logistical skepticism aside, and you’re left with a chilling story that evokes the nagging, gnawing complicity with which we live daily. The sweatshop worker, the victim of war crime, the permanent inhabitant of Guantanamo, the children in cages and ghettos. The guy modeling the horse testicles in that 200-hour videogame you just bought. Prosperity and luxury come at somebody’s expense, somewhere, no less real for being shoved out of view, for being repressed. When a young Adelaide wanders into a hall of mirrors in 1986, the entrance is made up to be a racist caricature of a Native American. In the present day it’s been literally whitewashed, but a new coat of paint can’t change the fact that it still leads straight to Hell. The most unsettling maker’s mark on Peele’s first two films is their subversion of identity. It’s this shared aspect that has demanded such harrowing performances from his casts, and the underlying structure of what is so godawfully frightening about them. Get Out took aim at the facile excuses people (usually white people) make as they benefit from racial injustice and violence, but the terror underlying that barbed commentary comes from a place sickeningly intimate for so many Americans. It is a tale of bodies stolen, of personalities subverted, without hope of rescue or resistance. The sheer physicality of that fear is written on the faces that Peele uses to fill his frames, in Get Out as in Us, in which he argues that kind of terrorizing ultimately makes a monster of both parties. After Adelaide finally faces Red and kills her, she and her family, miraculously whole, flee across a country facing a blood reckoning at the hands of the denizens of the underworld they ignored in blissful ignorance. We flash back one final time to the night Adelaide entered the hall of mirrors, and discover that her Tethered attacked her and changed places with her. We have been rooting for the Tethered to defeat the kidnapped girl, her real life in the sun stolen from her. If we’re the same deep down, then it follows that crime begets crime, violence begets violence. Peele, a black writer-director who centers his narratives on black protagonists, now has two original screenplays under his belt that have wildly over-performed at the box office and dominated critical discourse. He’s done it with films that articulate nightmares a lot of filmgoers haven’t been exposed to before. If that doesn’t shake up Hollywood’s calculus beyond just giving one really good director some more money to play with, it is to everybody’s detriment. Kenneth Lowe is a regular contributor to Paste. You can follow him on Twitter and read more at his blog.